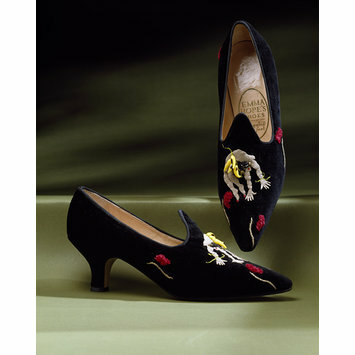 These witty shoes personify Josephine Baker (1906-75), the celebrated international singer and dancer. Known as the 'Black Goddess' of cabaret, she was famed for spectacular revues including her 1926 debut at the Folies Bergère in Paris. The highlight of the show featured an enormous flowered ball which gradually descended from the rafters and opened to reveal Josephine standing on a giant mirror. She was naked except for three gold bracelets on her upper arm and a girdle of rhinestone-studded bananas around her hips. The bananas pointed comically towards the ceiling and as she danced the Charleston they accentuated the forward and backward motion of her hips. The critics found the performance 'ravishing' but it was the banana waistband that caused most comment on the opening night and for years to come. It became so popular that a film clip of Josephine's banana dance ran in movie houses throughout the United States. Pair of woman's shoes with embroidered black velvet. 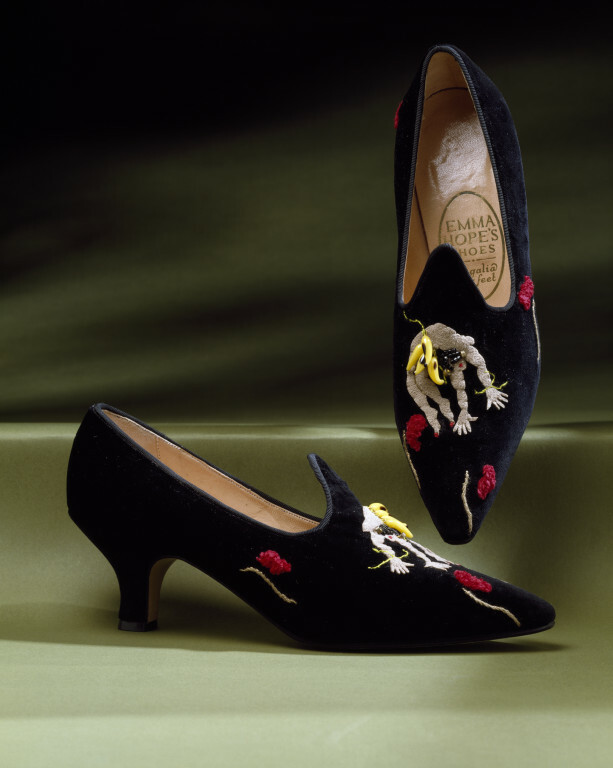 Pair of woman's shoes 'Josephine Baker', designed by Emma Hope, Great Britain, 1988. Cordwainers College, now part of the London College of Fashion, is associated with innovation and style, and has produced many leaders in shoe design. Emma Hope was one of the first graduates to attract publicity in the 1980s. Her shoes are often influenced by historical styles, tinged by nostalgia but also modern and original. These amusing shoes show Josephine Baker, the 1920s ‘Black Goddess’ of cabaret, dancing only in her infamous banana waistband. LADY'S DRESS SHOES "JOSEPHINE BAKER"
Emma Hope is one of Britain's leading young shoe designers. Her designs are classically based yet innovative in a range of rich luxurious fabrics, embellished with ribbons, feathers, tassels or metallic embroidery. "Josephine Baker" is a stately shoe, splendidly formal in black velvet with Louis XIV heel, confronted by a night club star with red toenail polish and a banana skirt.